DCCCA Board of Directors pictured back row left to right: Bruce Wohlers, Chris Caldwell, Morris Faiman, Ph.D., Donna Hoener-Queal, Howard Ebmeier, Ph.D., Pat Slabaugh, Sheila Vander Tuig Front row left to right: Ernesto Hodison, Nikki White, Krystal Butell, Jeff Davis Not pictured: Dorothy Devlin, LMSW, Rodney Bishop, M.D., John Monaghan, Jr.
DCCCA begins our new fiscal year with a new executive committee heading the Board of Directors. 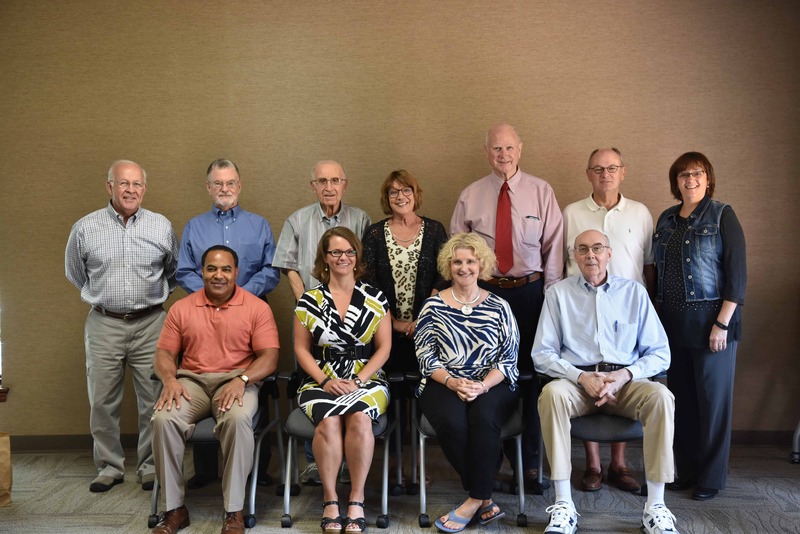 Committee members serve a three year term and this executive committee brings over 35 years of combined experience at DCCCA to their positions. The committee is now headed by President Nikki White, James Otten Dentistry, and includes Vice President Ernesto Hodison, Capitol City Bank; Treasurer Jeff Davis, University of Kansas Endowment Association (retired); Secretary Krystal Butell, Berry Plastics (retired); Pat Slabaugh, Central Bank of the Midwest, and Rodney Bishop, M.D. DCCCA’s Board of Directors meets monthly and is responsible for fiscal oversight and accountability, legal oversight, purchase and sale of physical assets (property), agency policy approval, risk management, and hiring and evaluating the chief executive officer. DCCCA coordinates programs across the Midwest to provide behavioral health prevention and treatment, recruitment, training, and support of foster homes, and traffic safety education and resources. We also provide evaluation research to their programs and partners.